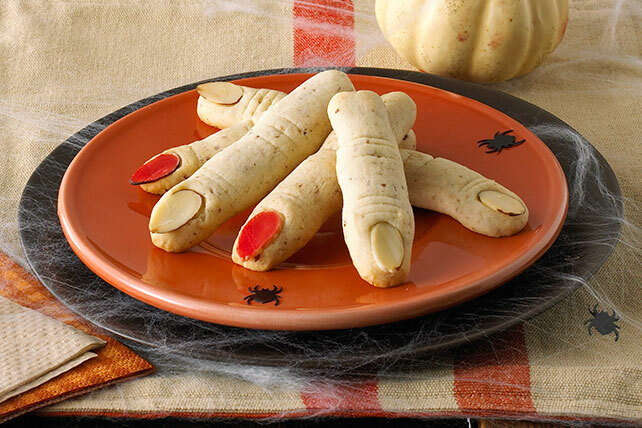 Get ready for a spook-tacular evening when you serve up our Frightening Witch Finger Cookies. These rather realistic looking Frightening Witch Finger Cookies are surprisingly easy to make. Your guests are sure to agree that Frightening Witch Finger Cookies are the perfect Halloween recipe. Roll dough into 40 (3-inch) "fingers," using 1 Tbsp. dough for each. Place, 2 inches apart, on baking sheets sprayed with cooking spray. Press 1 reserved nut into end of each dough finger for the fingernail. Use sharp knife to make 3 crosswise slits in top of each finger for the knuckles. Bake 15 to 20 min. or until lightly browned. Cool 3 min. on baking sheet; carefully transfer to wire racks. Cool completely. This kid-friendly cookie makes the perfect spooky treat for a special occasion. Brush nut on each cookie with red food coloring before baking. Makes 20 servings, 2 cookies each.